Sending a box of candy with a bouquet of flowers is the typical Valentine’s Day offering. Aside from lingerie, baubles or the overpriced dinner, what’s a gent to buy a suitor for Valentines Day without going over the top or being too generic? Perhaps, a edible basket filled with her favorite fruits demonstrates that someone understands her taste. But, then the question becomes which edible gift basket merchant purveys the best goods? If she’s NASCAR fan, a regular Harley Davidson rider or passenger or simply addicted to chocolate dipped fruit, then Edible Arrangements should appease her appetite for fruit carved to resemble flowers. The fresh fruit baskets arrive arranged in a container bearing the Harley Davidson or NASCAR insignia. The chocolate dipped fruit is another story, as Edible Arrangements features an assortment of options: chocolate dipped strawberries, a medley of fruit coverings (white chocolate, crushed nuts, coconuts), boxed dipped fruit or chocolate dipped fruit arranged in a bouquet. Also, shoppers choose between a free greeting card or a personalized one for a nominal fee. Few people are aware that the fruit bouquet company known for carving fruit in the shape to resemble an edible bouquet, Edible Arrangements also owns Dipped Fruit. From cinnamon, mixed nuts to chocolate dipped fruit, the holiday gift ideas are not as expensive as the inventory at its flagship website. As the online catalog features fresh edible fruit, the site does not feature as many of the brands trademark fruit bouquets. 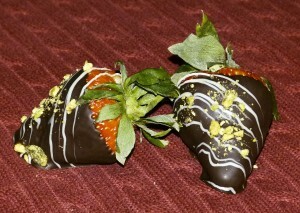 Nevertheless, Edible Fruit reviewed the Dipped Fruit site to present our readers with the best chocolate dipped fruit.